Geneva, 19 May 2017: This week the European Commission announced a significant financial contribution of 2.25 million EUR to the CITES Secretariat to help with the implementation of decisions adopted at CITES CoP17 (24 September – 4 October 2016, Johannesburg, South Africa), covering a wide range of species to strengthen the regulation of legal trade and to combat illegal trade. 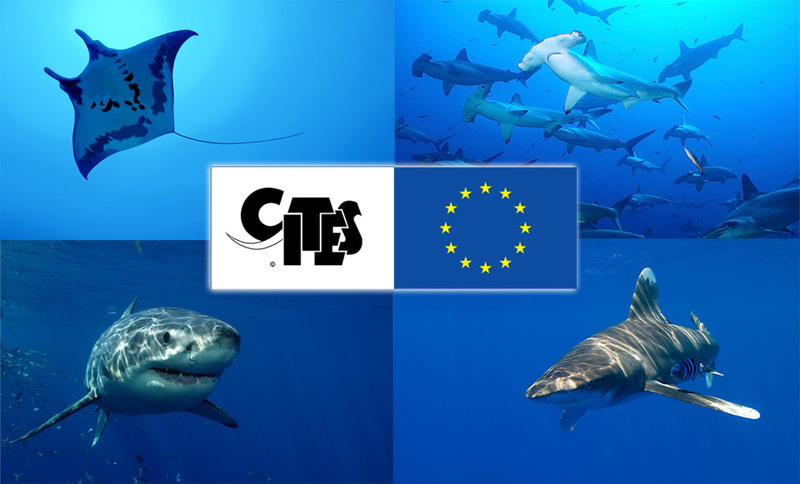 This generous EU contribution includes 900,000 EUR earmarked to support the capacity building work of the CITES Secretariat and its partners, including the Food and Agriculture Organisation of the United Nations (FAO), to assist Parties to implement CITES provisions on commercially exploited CITES-listed marine species. This is a role for CITES that has been recognized by the UN General Assembly in its resolution on Sustainable Fisheries. Mr Karmenu Vella, Commissioner for Environment, Maritime Affairs and Fisheries of the European Commission, said: "The EU has been a major supporter of the CITES Convention. In recent years it has made a lot of progress to ensure effective implementation of its rules and to fight wildlife crime. Last year's CoP made major progress in granting stricter protection to many endangered iconic species. Now we have to move on to resolute implementation on the ground. I am very happy that the EU's 2.25 million € to be provided to the CITES Secretariat will contribute to that important challenge." At CoP17, the largest ever World Wildlife Conference, CITES Parties continued the trend set at its previous meeting (CoP16, Bangkok, 2013) of increasingly using the Convention to regulate trade in marine species, including commercially harvested sharks and rays, by including an additional four species of sharks and all devil rays on CITES Appendix II. “For fisheries, CITES stands at the intersection between conservation, sustainable use and international trade, focusing on species that have declined to a level that require strong management measures to maintain or rebuild stocks, such as for the recently listed shark and ray species. We see CITES as being the direct opposite of illegal, unreported and unregulated (IUU) fishing. What CITES strives to achieve is legal, reported and regulated (LRR) trade in marine species,” remarked CITES Secretary-General, John Scanlon, at a recent UNCTAD briefing for the Ocean Forum in Geneva, Switzerland. CoP17 also adopted an unprecedented number of decisions on marine species, calling for studies and other actions to be implemented before its next Conference in Sri Lanka in 2019, including reviewing the conservation, management and trade of Eels, the Bangai Cardinal Fish and addressing a variety of capacity needs identified for the implementation of CITES for commercially exploited marine species. The project to be rolled out over 2017-2020 by the CITES Secretariat using this generous financial support will address the priorities identified by the CITES Parties and build on the experiences and the feedback received from the first capacity building project on sharks and rays from 2013-2016. It will further scale up well targeted activities to assist with implementation. The project will be able to take advantage of strong existing partnerships, and establish new ones, with a view to maximizing synergies, avoiding duplication of work and delivering outcomes in a coordinated and effective manner. In the context of the global development Agenda, as reflected in Agenda 2030 and the UN Sustainable Development Goals (SDGs), CITES plays a critical specialized role in advancing the implementation of SDG 14.4 – namely the recovery of stocks of CITES listed marine species to sustainable levels. CITES is a legally binding instrument that uses trade-related measures to achieve conservation and sustainable use outcomes and it complements the work of other organizations to improve fisheries management. By delivering needs-driven capacity building including for the making of scientific assessments (non-detriment-findings), ensuring legal harvesting (legal acquisition finding), reporting and trade monitoring, the outcomes of this project will help maximize CITES contributions to this and other goals under the SDGs. “We are deeply grateful to the EU for its continuing financial support for building capacity to help implement CITES for recently listed marine species” added Scanlon.